"The Knights are a very close knit team and the military skydiving community is equally close; we will support Corey's family and each other during this difficult time,"
Members of a U.S. Army skydiving team were planning to return Sunday to their base, where they will have access to counseling after a parachutist from their unit died from injuries suffered during a stunt at the Chicago Air & Water Show, a spokeswoman for the group said. The Golden Knights demonstration team has been put on a "safety stand down" after the death of Sgt. 1st Class Corey Hood, spokeswoman Donna Dixon said. The group will head to Fort Bragg in North Carolina, where they can meet with chaplains as the Army works to ensure everyone is mentally and physically fit to continue with the show season, she said. The team's performance schedule could be affected. Hood, of Cincinnati, Ohio, was pronounced dead Sunday afternoon at Northwestern Memorial Hospital in Chicago, according to the Cook County medical examiner's office. A day earlier, he collided in midair with a member of the Navy's precision skydiving team during the event along Chicago's Lake Michigan shoreline. Hood, 32, served five tours of duty in Iraq and Afghanistan and had earned numerous awards, including two Bronze Stars. 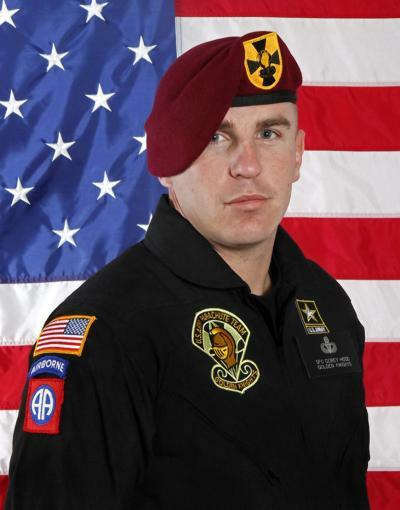 He had logged more than 200 free fall jumps and 75 military static line jumps during his career, according to his Army biography. He is survived by his wife, Lyndsay. "The Knights are a very close knit team and the military skydiving community is equally close; we will support Corey's family and each other during this difficult time," Col. Matthew Weinrich, commander of the U.S. Army Parachute Team, said in a statement. Chicago Mayor Rahm Emanuel said in a statement late Sunday that he and his wife were deeply saddened by Hood's death. "Our thoughts are with his family, friends and the entire Golden Knights community," Emanuel said, calling Hood "an American hero." The Army Golden Knights and Navy Leap Frogs parachute teams were performing what is known as a "bomb burst" Saturday when the collision occurred, Dixon said. During the stunt, parachutists fall with red smoke trailing from packs and then separate, creating a colorful visual in the sky. Hood collided with the Navy skydiver and was knocked unconscious, "which resulted in an uncontrolled offsite landing," Dixon said in a statement. Spectator Heather Mendenhall told the Chicago Tribune she was watching the show from a rooftop and saw Hood strike the roof of a high-rise building next door with his feet and then fall — his parachute trailing behind him. "His legs caught the tip of the roof, and then he fell over. It was horrible," she told the newspaper. The other parachutist, who has not been identified, landed on a beach near the main viewing area for the show, Chicago Fire Department spokesman Juan Hernandez said Saturday. He was treated for a broken leg. The Army is investigating the accident. The team did not perform again on Sunday, the second day of the show that draws millions of people to Chicago. Headliners included the U.S. Navy Blue Angels.